This the second part of my report from the recent MW Bordeaux 2011 tasting in Sydney, with the first part here. Fun fact – the only Bordeaux I’ve ever bought en primeur was Sauternes. Indeed, I’ve purchased more Sauternes over the years than I have red Bordeaux, just because I love the stuff. Raymond Lafon, in particular, has a special place in my heart (reasonable value too), and d’Yquem is a wine that I wish I could afford to drink. Sauternes and I, we’re close. 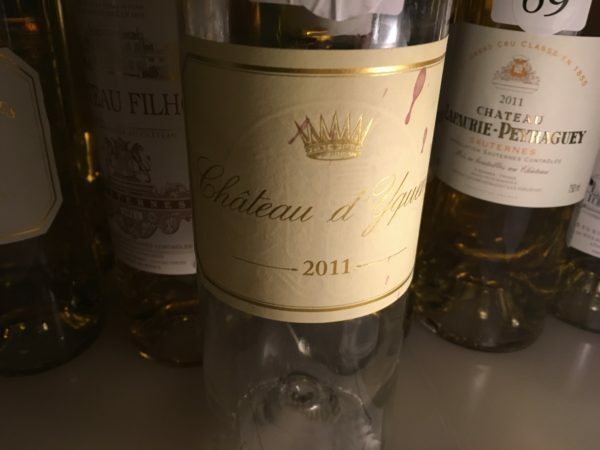 2011, while a challenge for making red wine, will go down as a top vintage for Sauternes, with the stop-start heat, rain, humidity and more all making for favourable conditions for botrytis. It was also favourable for less desirable diseases (like downy mildew), but you tend to get that when making botrytis styles. Bill Blatch gives a much more comprehensive roundup of the season here, so I won’t bang on too much about it, but suffice to say it was a good year for making sweet wines in Bordeaux. It all shows in the wines, which – as a group – were very strong indeed. Intensely flavoured, yet with an acid-driven delicacy not always seen in Sauternes, this bracket was a pleasure from start to finish. The only challenge that I could see was that some wines carried too much rot, robbing some wines from their absolute purity. Besides d’Yquem, these are not only great wines but also amazingly affordable (in context) – world class drinks, from a top vintage, and less than $100/bottle (for a 375ml at least). Perfect. Gentle passionfruit and lemon quince on the nose, it’s quite delicate and reserved, but the power builds so nicely through the palate that every sip is a delight of flavour. Amazing that it can be gentle but powerful all at once. Wonderful! Everything you’d want in a full flavoured sweet wine. 19/20, 96/100. This shares the gentle pineapple character of Yquem. Really notice the acidity here, bringing everything right back. Another lovely Sauternes, though maybe a little volatile. Will live forever. 18.5/20, 94/100. A little more jam here. Chunkier and without quite the detail of the last two. Builds though. Quality, if a slow burn, with it still coming together. Very good wine regardless. 18/20, 93/100. Can really see the botrytis here. A fraction overplayed? I found it a bit distracting. This was the least impressive wine in this whole bracket – it looked middling in context, without the necessary purity, though decent length. 16.8/20, 89/100. Immediately attractive. Definitely riper and sweeter but it works in this wines favour – rambunctious and quite delicious. Ready now too. Lovely. 18/20, 93/100. Just a brief comment on what you had to say about the Suduiraut; “will live forever”. Could do, but I’ve had stacks (and stacks) of Sauternes over the years that have oxidised thanks to the corks. So wouldn’t bank on it! Ah yes, the joys of cork!